That would be a Mark 43 and that would be a quarter-scale figure. Which means that it will probably cost north of $500. It looks like they're doing a 1/6 and a 1/4 scale version of that Iron Man toy. Another Hulkbuster this one four feet tall. Probably cost more than the hot toys one. Star Wars Black series stuff coming out soon. Also series two minimates of TMNT are out now. I wont be buying them but I liked all the extra stuff that comes with them. Oh yeah, definitely happy Ahsoka and the Rebels cast will be 6" Black figures. The line already has too many recasts in it. Shartimus primes are no laughing matter. There are no strings on this guy. I think the face is a little off on this one. So Batman and Bruce Wayne are different people? Man, all this time, what a shocking secret to uncover! This will absolutely be on a shelf in my place at some point. Funny thing about that Ultron picture is that I keep thinking that is a firefly ship in lower left hand corner. I collect Transformers and non-transformer unofficial transforming robots. Anyone else? Don't want to bore everyone! You mean the ones that go for over $100 of the fake G1 line? If so they look pretty good. I'm not sure how they get away with that though. I have G1 original Jazz, 20th anniversary prime and three alternators. I might pickup the new RC when she is released. I don't really care for the current Robots in Disguise line. I don't like the look and I don't like the one move transformations. I don't have any transformers and I'm not too interested. Transformers is just one of those properties where I feel you can fall into a "completion" mode all too easy. Why is Transformer any different to any other toy or model line when it comes to completion? I just buy what I like, personally. I know that there are completionists out there, but not many; the franchise is over 30 years old, after all. The third party industry is very strong right now, and Hasbro/Takara don't seem to be that interested in stopping the IP infringements that it involves. The prices are creeping up way to high, though; the bubble will burst soon. The main collector's lines right now are Masterpiece, which is official, and third party, which isn't. The 20th Anniversary Prime Baron has is actually the Hasbro version of MP01, the first Takara Masterpiece. Most of the MPs have only been released by Takara, not Hasbro. The third party companies largely fill the gaps Hsbro and Takara left behind. A higher state of nerdery,Mir such a thing is possible, can be found below. I always found the relationship between the companies fascinating; in the late 70s and early 80s, Takara developed a number of toy lines that featured cars, planes, robots, guns, dinosaurs, insects etc that turned into robots, such as Diaclone, Microchange and others. Hasbro bought the rights to produce and sell these lines in the US, and came up with the Transformers story line and characters, with the help of Marvel. It was so successful that Takara licensed the Transformers brand back to use in Japan, and a very long complicated relationship ensued. Yes, I meant me but there are SO MANY transformer characters. It is like people who collect WWE, Marvel Legends or the new He-Man. I'm not far from that. I sold 3/4 of my unopened Marvel Legends because I didn't see it slowing down but I still have 98% of the Star Wars Black 6: figures that have been released. Unopened still of course. I don't have any transformers and don't collect anything other than Hot Toys, but I like looking at all the stuff you guys buy, so you won't bore me. Discuss whatever you'd like! I'm interested. One of the unofficial transformers of Megatron. Hot Toys is pretty great but hella expensve. 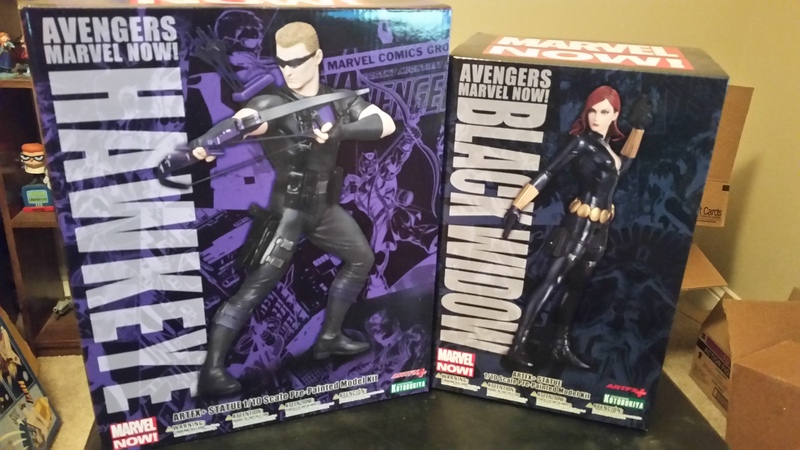 I plan to finish an Avengers party with these maquettes. Got the first two now I just need to get the rest between Lego purchases. Are you buying all these hot toys? LOL oh boy. You are making my sides hurt. I don't have any. If I could get Ghost Rider at the original price I would have bought it. I thought about getting Black Widow when it was on sell for $160 but I didn't see the point buying a figure that isn't one of my favorite characters at such a high price. The next figure I buy will probably be Ghost Rider and Misty Knight from the legends line which I think comes out in September. That Vision looks out of this world, but the prices on those are too high from source, never mind aftermarket. Baron, I transforms that not-Megatron for the first time last night, from robot to gun and back. It's insanely complicated and fiddly, which is just perfect for me! I don't really go for figures or statues, because as brilliant as they look, the fiddle factor is way too important to me. I buy the most complicated transfomers I can find, leave the instructions in the box, and work it out from there. The masterpiece line is fantastic as they look great on a shelf, but can always be picked up and faffed with. Ok, Flickr seem to have screwed up their website so that I cannot copy and paste on my iPad any more. Clever buggers. The big guy is Warbotron's take on Bruticus, which is the combined form of the 5 Combaticons. The blue and white guy at the back is Invisible, DX9's version of Mirage. We also have Smokescreen and Bumblebee being flailed around by Bruticus, Sideswipe climbing to try and attack the big guy's head, Streak trying to shoot the leg that is pinning Optimus Prime to the ground, Wheeljack on the other side of Prime, and Prowl standing next to Mirage. They are all official Takara Masterpieces, aside from Prime, who is Hasbro's. I have those Samurai star wars figures on pre-order from BBTS. There is also a Fett and Crimson guard coming out in the future. Paper craft TMNT. I've seen minecraft versions of these. This is my first time seeing TMNT versions. Runs for about $10. Not really my thing but I watched a review on it. The head and legs move and the weapons are removable.